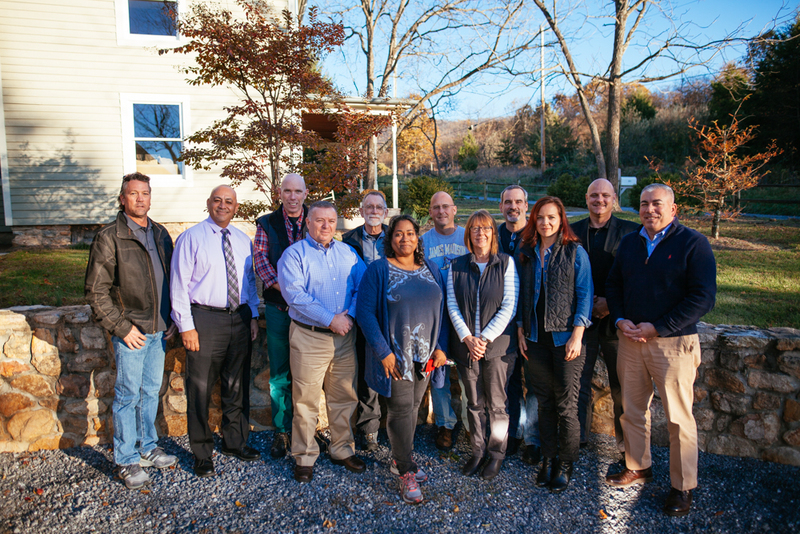 Representatives from six police departments across the country attended a law enforcement retreat on restorative justice Nov. 11-13 near Harrisonburg, Virginia. 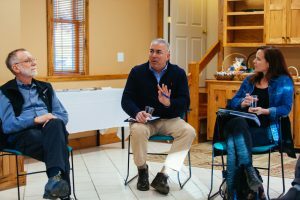 The retreat was co-hosted by the Harrisonburg (Virginia) Police Department and the Zehr Institute for Restorative Justice, a program of the Center for Justice and Peacebuilding at Eastern Mennonite University. 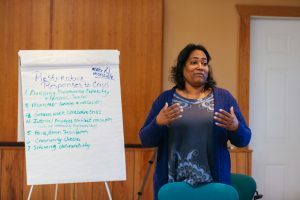 The group, which included five expert practitioners, came together for three days of discussion about restorative justice, an innovative approach that focuses on “repairing the harm of the crime and engaging individuals and community members in the process,” according to Professor Howard Zehr, co-director of the Zehr Institute. Zehr, who was present at the retreat, is known as the “grandfather of restorative justice.” He began as a practitioner and theorist in restorative justice in the late 1970s at the foundational stage of the field and has since led trainings and taught courses around the world. Vanessa Westley with the Chicago (Ill.) Police Department talks about restorative responses to crises. Agencies from four states —California, Illinois, Massachusetts and Virginia— were represented by executive leadership, who have led or continued to lead implementation of restorative justice practices in their respective jurisdictions. Six other department representatives were slated to attend. The goal of the retreat was to build networks, share resources, and gain insight into best practices, challenges and sustainability of restorative justice in law enforcement. Topics of discussion included personnel training, program sustainability, collaboration with faith-based and other community groups, funding and use of restorative justice in crisis situations. Participants were in agreement that utilizing restorative justice principles—being proactive, using good communication skills, building relationships and social capital by empowering and including community members — called for a holistic culture shift from “the top down and back up,” from new recruits to administration, said Chief Joe Garza, Reedley (Ca.) Police Department. At the same time, they agreed that many police departments, and individual officers, are already doing this kind of outreach, though perhaps under a different name. What would be optimal, however, is systemic buy-in and a nationwide professional commitment to this different kind of accountability, they said. Bedford (Mass) Police Chief Robert Bongiorno makes a point during a session. Listening are Howard Zehr (left), co-director of the Zehr Institute for Restorative Justice and Jennifer Larson Sawin, who worked with Bongiorno while director of the Communities For Restorative Justice. The traditional penal system causes irreparable harm to communities, participants said, while restorative justice processes, if done correctly, reduce the frequency and severity of future offences by keeping the offender in the community and involving stakeholders in repairing the damages. The process is sometimes called “restorative justice diversion,” because the pre-charge referral and subsequent voluntary participation agreement from the offender shifts the case out of the traditional legal system. Youth and adults complete an accountability process that is “much tougher than going to prison,” Bongiorno says. This includes taking responsibility for the harm and taking action to repair the harm. The process allows offenders to stay connected to the community, keep their jobs or continue with schooling, and maintain crucial relationships. Several retreat participants reported being initially distrustful of the restorative justice process, only to share transformative experiences when observing the benefits, which include a way of building relationships and trust between police and the people they serve. “Six years ago, I would have said everyone in this room is crazy, but now I say, ‘Why didn’t we figure this out 25 years ago?” said Garza. He was accompanied by Officer Marc Ediger and former police officer John Swenning, now a restorative justice facilitator with West Coast Mennonite Central Committee. The three men collaborate as part of an initiative called the Reedley Peace Building Initiative. Though this group of law enforcement professionals is enthusiastic about restorative justice, they often must educate the public and their colleagues about the practices. If changing minds was a theme, changing hearts certainly wasn’t. “We don’t become police officers so that we can incarcerate people,” said Vanessa Westley, a 25-year veteran of the Chicago Police Force. Westley is coordinator for Bridging the Divide, part of the police department’s Chicago Alternative Policing Strategy (CAPS) program. In this case, participants plan to meet again next year, work towards formalizing their association, actively promote their successful restorative justice programs, and network more broadly among colleagues to share resources and encourage implementation of new programs.